Welcome to the first LRC blog post of the academic year. We would very much like to say welcome to all our new students and hello again to all our returning students. We hope you have all had a fantastic summer and are now all geared up and ready to learn. The LRC has had a big clean up over the summer months and you will find many new books on the shelves - all in line with the new linear A-Levels. But, if you think we are missing anything, do let us know either in person or via one of our suggestion boxes so we can make sure to order further titles in. The big change this summer is how we loan laptops. This September we are introducing self-service laptop loans. As before, these laptops are for use in the LRC only and can be borrowed for up to 2 hours. 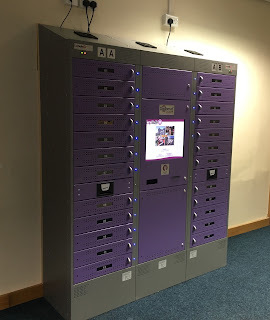 You will find the new exciting purple self-service locker on the upper level of the LRC. You will need your student ID card to borrow a laptop and full instructions are on the touch screen - however if you are struggling, please don't hesitate to ask a member of staff. We would love to hear your feedback about this new service - so please let us know what you think.